What Day Of The Week Is October 6? 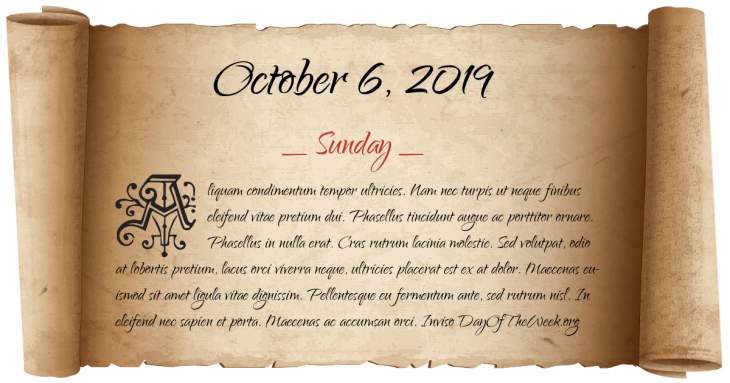 October 6, 2019 is the 279th day of the year 2019 in the Gregorian calendar. There are 86 days remaining until the end of the year. The day of the week is Sunday. The Great fire of Newcastle and Gateshead starts shortly after midnight, leading to 53 deaths and hundreds injured. Thomas Edison shows his first motion picture. Ossian Everett Mills founds Phi Mu Alpha Sinfonia in Boston, Massachusetts. New Premier Hua Guofeng orders the arrest of the Gang of Four and associates and ends the Cultural Revolution in the People’s Republic of China. The first prototype of the MiG-29, designated 9-01, makes its maiden flight. 51 Pegasi is discovered to be the first major star apart from the Sun to have a planet (and extrasolar planet) orbiting around it. Who were born on October 6?